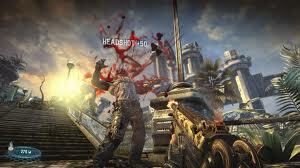 With pumped up behemoths running around with a multitude of guns and foul language, Bulletstorm was a controversial title that managed to upset the upholders of our moral integrity, Fox news. As soon as I heard their argument that the game was full of profanity, crude behaviour and innuendo it highlighted my interest. Just how bad could this game to create a backlash that included an article and a spot on a broadcast show. On a side note I wonder how pleased the Marketing firm hired to promote this title were to see it on TV being berated for its content, all publicity is good publicity after all. So with the prospect of a return to my juvenile state I was pleased to see my rental list stating Bulletstorm was on its way. I had already played the Demo when it was first released and although it was fun it did not do enough for me to warrant a purchase now to see if I made the right choice. The tone of the game is shown when you chose your playing level in single player there are five levels from very easy to very hard. If you chose the lowest level it’s quoted as being; “for players who have never played a shooter before and their grandmas.” That sets up the type of humour you will have to get used to during this game. The voice acting is very gruff and the language is strong but this an 18 rated game so it does not feel out-of-place. The visuals carry the adult theme along with successful throat shots creating torrents of blood pouring from the wound. The art style is generally bright as the planet where most of the game is set has a rich colour palette. 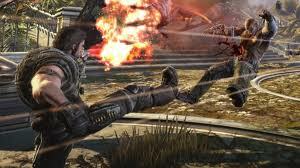 The gameplay is based around the first person shooter (FPS) mechanic. Your base weapon is an assault rifle and as you progress through the game you can collect and rank up weapons as well. If you are looking for a deep RPG levelling system you will not find it here. You are allowed to choose two secondary weapons to use and these allow you to navigate certain sections of the game. All of the guns have their particular quirks , for example the sniper rifle allows you to control the bullet once fired so you can use it like a guided missile, as you get close time slows and the enemy will try to evade the shot. 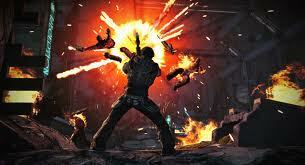 Each weapon also has a Secondary fire which you have to purchase from the drop boxes scattered around the planet. Kills are rewarded with points and these are used as the currency within the game. At regular intervals you are shown an icon on the screen indicating a drop box is nearby find it and you can access weapons upgrades and shop accordingly. They are generally not well hidden a few are but as the game is very linear you will usually come across one just following the path and looking around. The box is accessed using the leash but more on that later. At the start of the game you only have the Assault rifle and the use of your boot. Halfway through the first chapter things start to get interesting as you acquire a Leash. The leash allows the game to rise above basic FPS fare. The leash is an electrical whip that you use to grab an enemy and pull them towards you. As they get close the slow down camera is activated and you can choose to shoot or boot, you can also pull the enemy into environmental hazards such as electric fences and cacti. The leash has no ammo but it does have a secondary fire called the thumper. Think of it as a grenade it’s a good addition with limited range and a long activation but does give a really powerful form of attack. If the leash raises this game above the standard fare the Skillshot is what really sets this title apart. It creates a game within a game. As you kill an enemy you get a basic kill score as previously mentioned but you are able to gain extra points by completing challenges (viewable in the select screen). These are linked to particular weapons as well a generic kills. For an example if you shoot an enemy in the backside it’s called a “rear entry” kill (again the humour shows it ugly head), you can do mixed kills such as pull an enemy with the leash then kick them onto a cacti for the “Pricked” award. There are loads more combinations for you to explore and they are a fun edition to the game. The developers have added another mode called Echoes which tasks you with going through levels from the campaign trying to get as many points from kills as you can. It’s a great use of the Skillshot multipliers as you can compare your scores against those of your friends. It adds a competitive feel and as it’s not hidden by the online pass it makes the competition accessible to everyone. 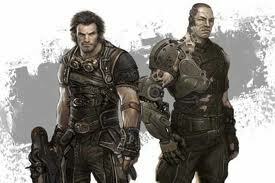 So with a few friends who have the game it could extend the titles life. However the Echoes show the game’s biggest flaw. As you do not have a story you just concentrate on having fun killing people. Then when you go back to the campaign again you get so carried away with completing the challenges you forget about what is a generally a clichéd vanilla post apocalyptic revenge story. It’s not that the story is bad it’s just been there done that. It does have one or two nice touches like using a robotic dinosaur to take out your enemies but this is just a different take on the UAV drone mechanic from Modern Warfare 2 and every other laser guided weapon mechanic on show in games today. It’s frustrating because Epic did the hard part by creating a gameplay mechanic that feels fresh but then they wrapped it up in a less than overwhelming story. It does give me hope for future titles but I’m glad this game was just a rental.